As a brand, Coleman is incredibly popular when it comes to supplying tents, and their freestanding Sundome 4 Person Tent is an excellent choice with an incredibly budget-friendly price tag. It’s well worth considering if you are looking to invest in a 3-season tent, which is what this one is. That means it will be perfect for pretty much all year round, and most weather conditions apart from icy extremes. For example, if you are looking to go camping in the summertime when you will require plenty of ventilation to keep you cool. Alternatively, if you are camping out in the Autumn when chances are there will be frequent rain showers and gusts of wind, then you are going to require a tent that will keep you dry and safe from the inclement weather. Let’s delve in deeper and take a look at some of its outstanding features and benefits. You can always trust Coleman to come up with handy, innovative features that go a long way to making your camping experience more pleasurable. With the Sundome tent, there are plenty of extras to shout about. There are handy circular rings fitted in the middle of the tent which are ideal for hanging a lantern or other lightweight items such as clothing. Perhaps, though, the most attractive feature of this tent is just how easy it is to assemble. It is snag free and with its continuous pole system, saves you time which you can spend doing more interesting things like exploring your surroundings. The set up should take only one person and no longer than ten minutes, which is ideal. Cleaning and maintaining proper care of your Coleman couldn’t be easier either. All you need is a sponge and some mild soap or detergent to simply wipe clean in between use so that you are always unpacking a clean tent ready to use on your next adventure. Just let the tent air dry thoroughly before you re-pack it. Very conveniently, too, the tent features an E-Port, which means you can bring electrical power right inside your tent. Great if you want to listen to some music while relaxing after a hard day exploring the local vistas. While the tent is marketed as having four-person capacity, we think it works particularly well for two people, with ample floor space to incorporate a queen size airbed so that you can enjoy your camping trip with a little more of the home comforts. Let’s face it, not everyone wants the full survival experience! There are also small mesh pockets featured along the interior walls of the tent, which make an excellent option for storing smaller and more expensive items that you want to keep secure, like cell phones. There’s no need to be concerned about getting wet inside your Coleman Sundome tent either, as it has stay dry internal tub-like floors with protective corner welds and inverted seams that are highly effective at keeping water out, so you can be sure your things stay warm and dry. While the tent is marketed as a 4-person capacity tent and there is enough floor space to accommodate 4 sleeping bags, if you want a truly comfortable space it is better suited to a couple or a maximum of three people. There is no external vestibule area, so you will need to store your essentials inside the tent with you. For that reason, we do recommend it for a maximum of three. It is easy to set up, lightweight, and portable, so this makes it a genuinely comfortable tent for a shorter overnight trip or weekend trip when you want something that is quick to assemble, so that you can get on with enjoying the precious time that you do have. The exceptional value price tag means that this is an affordable and accessible entry tent, and it’s great for occasional use and shorter camping trips. You get everything included with your purchase to quickly assemble and conveniently transport your tent with you on trips. There are ten stakes, three shock-corded fiberglass poles, a handy rain fly to keep you dry, and the tent body itself which is made from a fire retardant material. The tent and all the accessories are presented in an attractive carry bag so that you can pack up and go anytime. If you think you are going to need more space than is offered by the Coleman Sundome 4 Person Tent, you could always upgrade and go for one of their larger models like the Evanston. It is still quick and easy to assemble, but has more internal room for 6 to 8 people. Alternatively, you could always go for the Dome, but purchase instead the model that has an additional screen room so that there is also some valuable extra external covered space, useful for storing more of your belongings. 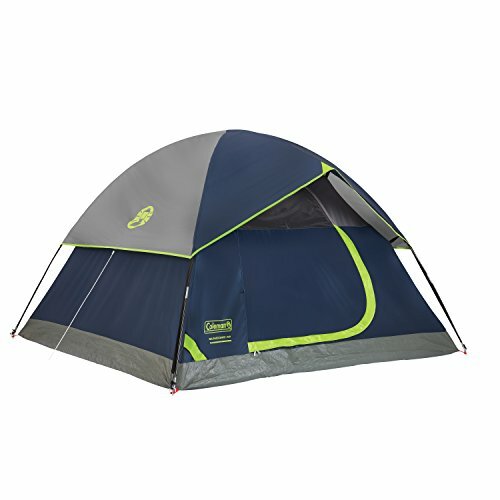 If you are looking for a cost-effective, nicely designed, and easy to assemble tent, then the Coleman Sundome 4 Person Tent is an incredible option. Offering plenty of ventilation and tons of convenient features, it is a great little tent for a weekend camping trip. Pops up and packs away quickly and neatly, and all stored inside a handy, portable carry bag. Best used for milder weather due to its lightweight construction. It is a superb tent that you will get enjoyment out of for years to come.